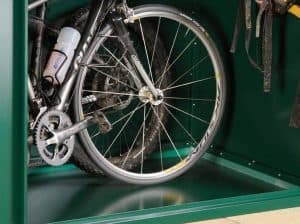 The 6′ x 3′ Asgard Premium Metal Bike Store offers you the most secure and reliable way to keep your bikes safe from the rain and also to stop bike thieves from being able to take your bike. This is sturdy, good looking and up to the task of providing your garden with some extra storage space that will last you for many years. 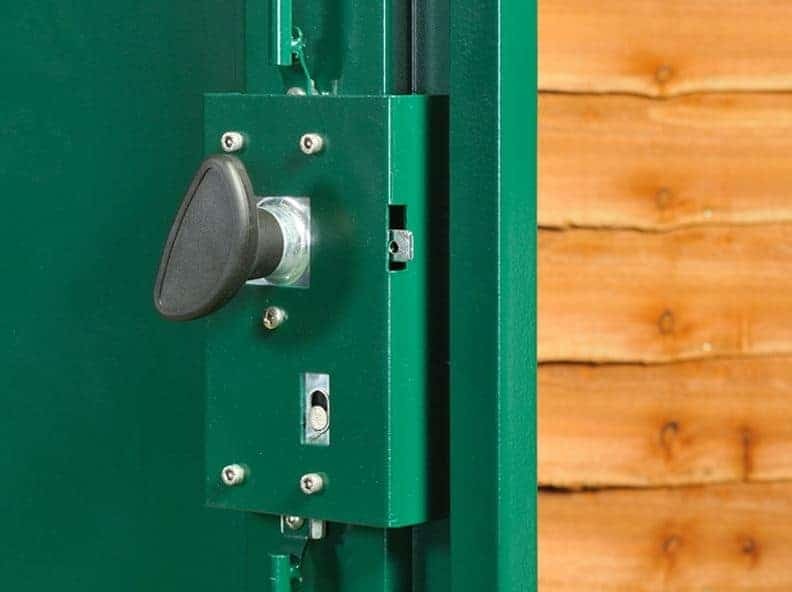 It has been cleverly designed to offer the highest protection, but it has been given a look that will let it blend into any style of garden and go unnoticed which is just what you want when trying to keep things safe and hidden. No matter if you are looking for a space for bikes or even somewhere to keep your tools and gardening items safe and dry, the 6′ x 3′ Asgard Premium Metal Bike Store will be up to the job. What makes this so secure is the textured weatherproof galvanised steel which has been used all through the bike store. This makes it very sturdy and also incredibly low maintenance. Large double doors which can be placed on either side of the bike store make getting things in and out very easy. With 6 X 3 of storage space to make use of, you will be able to keep many things safe and secure inside here. 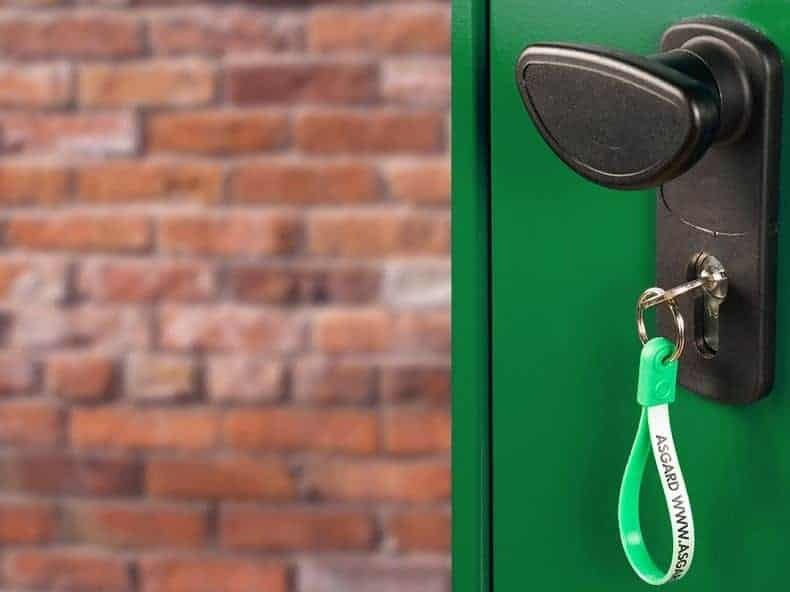 Here we have one of the most impressive ways to keep your bikes locked away from bike thieves and also serve as a fantastic and secure place to house a number of items such as tools, gardening equipment or just anything that does not have a proper home and sits out in the garden. 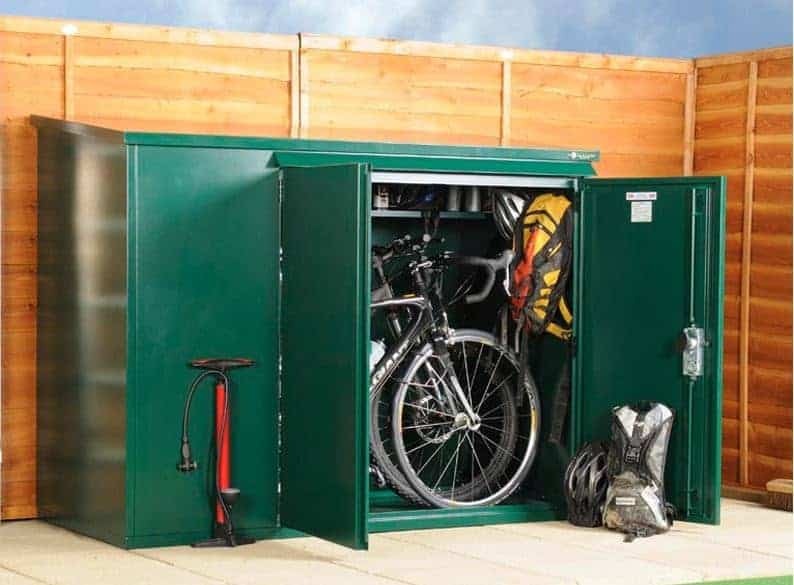 The 6′ x 3′ Asgard Premium Metal Bike Store offers you a great deal of storage. You can easily fit in three adult sized mountain bikes in here with no trouble at all. It is 6 feet wide and 3 feet deep which gives you all kinds of space to make use of. While this can be used to store anything you want if you were to use it as a bike store as well as fitting in those three bikes you could easily fit in a bunch of other stuff with them as well like tools, tyres and anything else you need to keep your bikes in great shape. At the highest point (which is the back) there is a very impressive 4 feet 9 inches while at the very front there is 4 feet 5 inches. Asgard have gone with a pent roof for this bike store and that is something we are very pleased to see as we feel that it works incredibly well. A pent roof will stop the rain from sitting on top and eventually finding its way inside. Keeping the rain out is very important to make sure that your bike or whatever else you may have in there is kept rust free. This is one very tough bike store so you could have a good few inches of snow sitting on top and it will not have any effect at all. When you first stand in front of the 6′ x 3′ Asgard Premium Metal Bike Store we feel that it is pretty much impossible not to want to give it a little tap. Well when you do, you will be very impressed with how strong the bike store feels as it is in fact made from galvanised steel. This really does make this one of the strongest and most secure bike stores on the market right now. The whole thing just feels like it is built to withstand anything the weather can throw at it and also keep people out. Asgard have used a very nice green paint on the store and we feel that it is a colour which should fit into any garden. Most sheds or other bikes stores require a good and strong frame inside to keep things secure. That is not the case here, you see the galvanised steel which this is made from is so strong that once it is all pieced together there is no need for an extra frame inside. This lets you place things inside right up to the edge of the walls and it also helps keep the cost down a little bit. This is a bike store which has been made so that you can put a lot of things inside and that is evident from the high quality flooring which is once again made from galvanised steel. This material really is incredible and will be able to take the weight of anything you want to keep secured inside here. One thing that we love about the 6′ x 3′ Asgard Premium Metal Bike Store is just how easy it is to look after once it has been built. Asgard give the bike store a textured waterproof finish which looks great, but will also allow it be able to take a real beating from the rain for many years. There is no need for you to treat it, but a wipe down once or twice a year would keep it looking good. You get a fantastic 10 year warranty with this bike store. 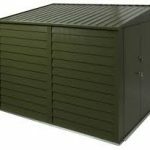 We think that because of the galvanised steel and the fine water proof finish, you will have a storage space that will last easily for double that amount of time at the very least. There are two large double doors on here which when open will allow you to get bikes or anything else that is large in and out without any kind of hassle or you resorting to swearing and just throwing it inside. You get an even 3 feet 9 inches of width and height when the doors are open – this really is a lot of space and this will save you getting frustrated trying to get your bike out. One thing that we love about these double doors is that when you are building the bike store, you can decide if you want the doors to the left or the right. There are no windows which is not all that surprising as the job of this bike store is to keep things locked up and out of sight, and that is hard to do when you have a window advertising to the world what you have inside. You do not get much more secure than what is on offer here. 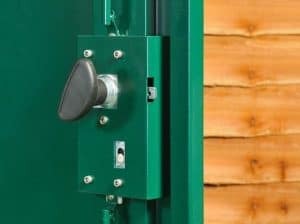 Those large double doors are kept locked up tight with a strong and reliable three point locking system. 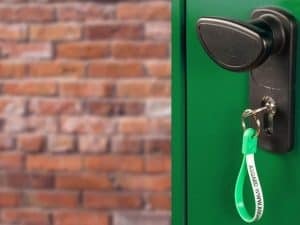 In general this bike store offers you such a strong and safe place to store your items that we think it offers just incredible security in every regard. The lack of windows and the way that the doors close so tightly make seeing inside here not possible. This is perfect if you have some expensive or special things that you want to keep hidden away. There is nothing you can do to customise the outside of the bike store, but inside you can really make it your own by taking your time and planning out how you are going to store things. You can easily add some hooks inside if you want to hang things up like bike helmets and spare wheels. This not only keeps them off the floor, but it looks so much more neat and tidy as well. No extras are required here which is always great. You get everything you need right out of the box. You can bolt the bike store down if you want, and it actually comes with the bolts to do this. We love it when a bike store or a shed comes with everything you need and there is no need to buy anything else. 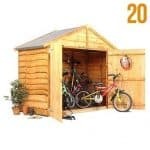 We admit that this is not the cheapest bike store or shed in the world, but you are paying that little bit extra for something that is very high quality. We feel that the galvanised steel and its weatherproof finish will easily outlast the ten year warranty. Plus a great bonus is this is going to last you many years without you really having to do anything to look after it. Being able to fit three adult sized bikes is great and even if you use this for general storage you are still going to have plenty of space to make use of. You and a friend can have this up in just a few hours. There is not a whole lot of pieces that you have to put together so we are sure even people who usually shy away from DIY will be able to build this. 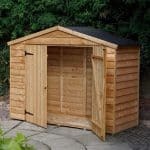 At £487.99, you are getting a storage space here that is going to last you many years and not require you to do much in the process to look after it. In this regard we do feel that it offers excellent value for money. 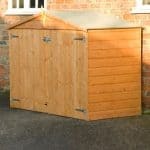 Final Thoughts: This is a very impressive looking and reliable way to add some storage space to your garden. 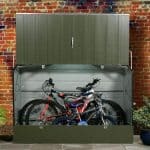 The 6' x 3' Asgard Premium Metal Bike Store is built to last thanks to its galvanised steel body and we feel that the design of it of the bike store will enable it to go into any style of garden and be used for many years. It offers you just a great amount of security and storage space, but it needs next to no maintenance which is something we are sure many people are going to love. While the price at first glance may seem on the high side, we do feel that you are getting a lot for your money here and have no problem recommending this at all.